Huge Savings Item! 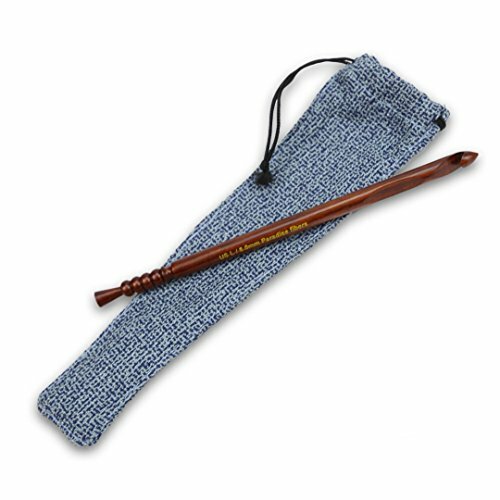 Save 17% on the Paradise Fibers Artisan Crochet Hooks - Rosewood, Size J 6mm by Paradise Fibers at Designers Artists. MPN: ROS-J. Hurry! Limited time offer. Offer valid only while supplies last. Introducing Paradise Fibers Handcrafted Hardwood Ebony & Rosewood Crochet Hooks. Our beautiful hooks are hand made from harvested Ebony & Rosewood. Introducing Paradise Fibers Handcrafted Hardwood Ebony & Rosewood Crochet Hooks. Our beautiful hooks are hand made from harvested Ebony & Rosewood. With beautiful handcrafted designs and details that allow for a smoother and more comfortable crocheting experience. These artisan hooks are polished and finished to bring out the beautiful natural wood grain patterns in each hook. Every hook comes in a woven drawstring satchel that is soft and durable to protect the hooks and allow for convenient, safe transportation. These hooks are oil rubbed and smooth to the touch with an indent on the front side for comfort. Every hook comes in a woven drawstring satchel that is soft and durable to protect the hooks and allow for convenient, safe transportation.